There’s a new wooden bike on the block. And with features such as embossed flames, an embroidered chopper-styled seat, and a fat black-walled rear tire, it’s bound to quickly race to the head of the pack. According to the website, Early Rider mini cycles are the “most stylish, perfectly made and safest bikes available.” While there really isn’t a quantifiable way to prove that last bit, just one look at these bikes confirms the first two claims. Early Rider, a British company, was created by dad, Andy Loveland, who set out to design a stabilizer-free bike both he and his son would love. The first prototype, the ‘Classic,’ was completed utilizing British innovation, and borrowing copious amounts of West coast lowrider flair. With fundamentals that seem to be in line with those found in a LIKEaBIKE, PedoBike or Wishbone, it is obvious that Early Rider is simply going for that ‘Easy Rider’ nostalgia. With the resulting bikes pictured here, who can blame them? Yet with a wooden bike this mean looking, I am surprised that the Early Rider website does not yet offer helmets in their “complete the look” section – even biker dudes wear those. (Leather jacket, mirrored shades and stars and stripes bandana optional). Early Riders start at $159 at the North American distributor’s website (which includes UPS international shipping to the US). Great bikes. TykeRider.com just launched which is the first US online retailer to offer the Early Rider products. Come to our site for more information on our products. Andy has designed a great product for his son, and we are excited to be teamed up with him. Keep riding! Hi- I only heard about this learner bike from a kids' store frequented during my pregnancy until now. My boy will be almost a year and a half at Christmas. Initially, I bought him a tractor- a Vilac tractor. But changed my mind because he already has a lot of kiddish push/ride toys. I spent at least an hour on the net looking at other learner bikes and decided that this is the one that I would want for him. The owner of the store tried to discourage me into making the exchange, but I told her that I would rather spend a little more $ to buy the bike for my son. Although he will be a little young at Christmas, who is she to gauge the physical development and abilities of my boy? Nate is a fearless 15 month old. He climbs chairs and stands on them, climbs on and off the bed as I'd taught him from 7 months, and is running and pivoting when chased. The bike was $199+tx and the helmet $55+tx. After more time on the net, I found a shop that sold Little Nutty bike helmets just a block from where I bought the bike. This seems like a lot of money for one Christmas present and it is. But the confidence and physical skills that Nate will learn and master is priceless. I would rather buy him one awesome gift than a bunch of garbage. IE. plastic toys and stuffed animals that will forever be in landfills after we all go. Just my opinion. Cheers! There's a new wooden bike on the block. And with features such as embossed flames, an embroidered chopper-styled seat, and a fat black-walled rear tire, it's bound to quickly race to the head of the pack. 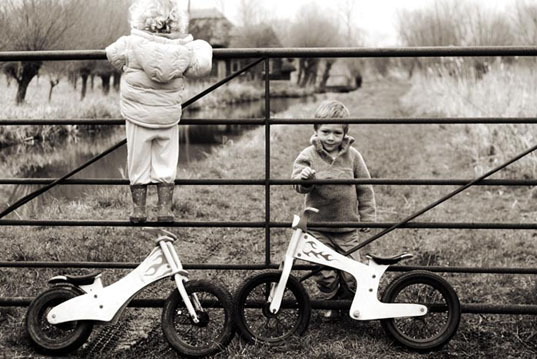 According to the website, Early Rider mini cycles are the "most stylish, perfectly made and safest bikes available." While there really isn't a quantifiable way to prove that last bit, just one look at these bikes confirms the first two claims.